Product prices and availability are accurate as of 2019-04-20 13:59:19 UTC and are subject to change. Any price and availability information displayed on http://www.amazon.com/ at the time of purchase will apply to the purchase of this product. Ditch the spray can! The Preval Sprayer Pro Pack is a great value pack for any project and it's ideal for large projects or requirements involving multiple colors. The Preval Sprayer Pro Pack is a professional-grade spray system good for countless applications. It’s disposable, recyclable, easy to clean, and best of all, no compressor is needed! 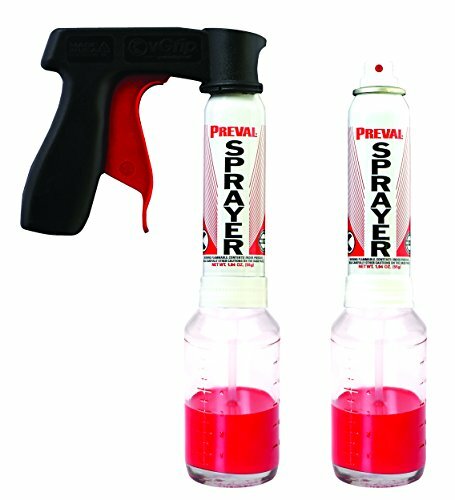 The Preval Sprayer’s patented Venturi Vacuum Process pulls liquid from any compatible, removable and refillable container and delivers a professional-grade spray stream to virtually any surface.! Includes, 2 Preval Sprayers, 1 vGrip, 2 Dip Tubes and 2 replacement buttons. The Preval vGrip is a gun handle with an ergonomic trigger that snaps onto the Preval Sprayer with ease. Made in the USA!